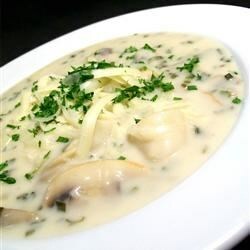 "A wonderful soup featuring white wine, onions and tender scallops. You may use either ocean or bay scallops." See how to make creamy chowder with scallops, potatoes, and bacon. A GREAT CHOWDER! NEEDS A LITTLE MORE LIQUID SO I ADDED MORE WINE SINCE I THINK THAT'S WHAT MAKES IT SO TASTY. DEFINITELY A KEEPER. This recipe has a wonderful flavor. I added a splash more milk and the consistency was perfect. Thank you for a delicious recipe.